Dr. Ernest C. Wilson is probably best known as "dean of Unity ministers" for 50 years. He also served as President of INTA in 1948, when that year's annual Congress was held at the prestigious Christ Church Unity in the Wilshire District of mid-town Los Angeles. Dr. Wilson had founded that church in the early 1940s, and it was attended by hundreds of New Thought students, who reportedly even stood in line in order to attend his services. Over the years many from the Hollywood screen community were in attendance, as well as the long time Mayor of Los Angeles, Sam Yorty. Mayor Yorty wrote in a news item for The Los Angeles Times of how he had attended Dr. Wilson's church, and how he and his wife began each day with a joint study ox Daily Word magazine. Prior to coming to Los Angeles to pioneer the largest Unity Church on the West Coast at that time, he had worked in various capacities at the Unity School with the Fillmore family, beginning in the 1920s. He had served as Editor in Chief of the Unity publication. His book entitled Adventures in Prosperity (1931) was the first prosperity book ever published by Unity School. He had later taught his master class series to as many as 1200 students in Kansas City in the early 1930s. I had friends who remember that class with great appreciation and later went on to demonstrate independent wealth, they felt, from their studies with Dr. Wilson. For a time, he followed Charles Fillmore as minister at Unity services in Kansas City before deciding to pioneer Unity on the West Coast. His Los Angeles church was located just a few blocks from the Wiltern Theater on Wilshire Boulevard, where Dr. Ernest Holmes, founder of the Science of the Mind teaching of the Religious Science movement, lectured on Sundays, too. Did these two great metaphysicians feel competition toward each other? Not at all. They both agreed that "there is no competition in Spirit." To prove it, on Dr. Wilson's first Sunday service a few blocks away from Dr. Holmes' service, Ernest Holmes sent Ernest Wilson a large bouquet of colorful flowers, welcoming him and his ministry to Los Angeles and to "the neighborhood." What class! My first memory of Dr. Wilson in person was at Unity Village, where he spoke. He had the looks of a movie star with his perfectly styled white hair, his California suntan, tailored clothes, and impeccably appropriate jewelry. He delivered his New Thought message with an understated sense of humor and a certain endearing humility. I was later privileged to work with him at Unity retreats at Unity School, where we were both the featured speakers. As a person who had gone from rags to riches, through his study of New Thought, he encouraged me in my prosperity studies. I first got to know him personally in 1964, when Unity School asked me to conduct prosperity lectures on the West Coast. After lecturing at his church, he invited me to dinner at his Hill House, located in the Hollywood Hills. From his living room, one could view the hundreds of lights of the City of Angels down below. Even though Dr. Wilson had recently had very serious and painful surgery, the subject was never mentioned. He seemed fit as a fiddle, and we had a delightful evening and dinner. We were joined by his Assistant Minister, Reverend Ron Potter, and his wife, Beverly. Later Dr. Wilson returned to Kansas City to head the ministry at the Mother Church, Unity on the Plaza, where he served until his retirement at age 80. During that period he invited me to serve as a guest minister for several weeks while he took a trip around the world. It was a busy, happy time for me, enhanced by the fact that many of the staff were long time Unity Students who often related stories about the early days of the Fillmores and the Unity Movement. They shared with me incredible stories of the miraculous power of our New Thought teachings from early on. When Dr. Wilson later lectured for Unity of Austin, Texas, he drew the largest attendance of any guest speaker during that era. People who had heard him speak in Los Angeles years earlier, or had read his books, or had been familiar with his radio or television programs, even came out of the Hill Country of Texas to hear him speak and to joyously greet him again. In 1968 INTA recognized Dr. Wilson's many years in ministry by honoring him at the annual INTA Congress, held that year in Denver, Colorado. Not only was Ernest Wilson impressed by this honor, but so were many of the officials of Unity School who attended, including members of the Fillmore family. The last time I saw Dr. Wilson was at the Unity Conference in 1976, held in Philadelphia, Pennsylvania in recognition of our country's 200th anniversary. On behalf of the Association of Unity Churches, Dr. Wilson conferred a Doctorate of Divinity on me, on Dr. Blaine Mays, President of INTA; on Glenn Mosley, who later became CEO and President of the Association of Unity Churches; and on various other long-time ministers, most of whom have now made their transition. "Although we are spiritual beings, we still function in human consciousness at times. Betrayal is a universal experience that we all suffer from — either personally or professionally, or both—at various times in our lives. When we realize it is a universal experience, we can more easily release it and move on." On a lighter note, after being highly complimented, he dryly commented, "Halos are very hard to wear. They can get so heavy that they tend to fall off and hit us on our 'clay feet.'" Dr. Wilson reached near and far with his New Thought messages through his books, radio programs, television shows, lecture tours, and working first at Unity School, then later serving two of Unity's largest churches. Yet perhaps his greatest contribution to the New Thought Movement was one I only learned about recently. In the 1940s, when Dr. Wilson was pioneering Christ Church, Unity, in Los Angeles, Blaine Mays and his family attended services there. Blaine recently told me, "Dr. Wilson was one of the first ministers I studied with." There is a belief that our earliest New Thought teachers often have the greatest impact in launching us on out spiritual journeys. How could Dr. Mays, his family, or Dr. Wilson know then that through their association, Blaine was doubtless being prepared to serve the International New Thought Alliance as President for many years, even carrying it from the 20th into the 21st Century? "One person can make a difference, and every person should try." 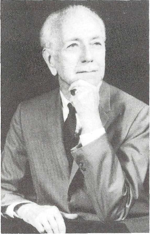 Even though Dr. Wilson touched thousands of lives with "the good news" during his long and eventful life, both the Unity Movement and INTA were doubtless the chief benefactors of his long-term consciousness of Truth. Thank you, Ernest Wilson! © Catherine Ponder. All rights reserved. No usage or posting of any kind is permitted without prior written permission from Catherine Ponder. We should join and participate in the INTA because it has promoted New Thought worldwide for over 100 years. As we learn from Catherine Ponder in these pages, it has done this primarily through rich relationships, national conferences and the dedication of individuals, such as the Mays family and many others. INTA has earned and deserves our support. Click here to join and support the INTA.